Home > Respiratory Supplements > Can Echinacea Improve my Respiratory Problems? If you ever thought that having a cold meant having to suffer, think again. Soon, we may all be saying goodbye to runny noses, coughs and associated respiratory problems. Echinacea, a herbal remedy, has been found to decrease the chance of coming down with a cold by 58 percent, and cutting the duration of a cold by 36 hours, according to a US study. While some other studies have shown that echinacea does not have any benefits in helping reduce cold symptoms, the recent study conducted by the University of Connecticut School of Pharmacy showed that it did. Researchers in the UK concluded that the study could help significantly in the battle against the common cold, but said that more clinical trials were needed. 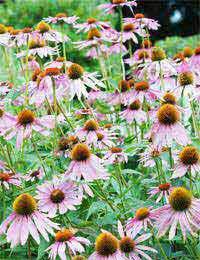 Echinacea is the group name for a collection of nine different plant species which all originated in North America. Only three of the species are used for medicinal purposes but nonetheless the plant has become one of the most popular health supplements available. Scientists think its secret lies in the fact that it boosts the body's immune system. Different parts of the echinacea plant are used in different preparations, and many herbalists believe that they are crucial in helping the body's immune system fight against infection. It is primarily used today to treat symptoms of cold and flu such as runny nose, fever and scratchy throat, although some people believe it can be helpful in treating yeast infections, ear infections, hayfever and even athlete's foot! The name echinacea comes from the Greek word echinos, which means hedgehog, as the prickly head of the echinacea plant resembles this edgy animal. For centuries people have used this herbal supplement to treat all sorts of ailments, from diarrhoea to syphilis to malaria. It began to lose some of its widespread popularity following the introduction and usage of antibiotics, but later was able to come back with a vengeance, taking its place as one of the world's top health supplements. Much of the research conducted on the echinacea plant has been conducted in Germany, where herbal health supplements are strictly regulated by the government. There, the parts of the Echinacea purpurea plant which are above ground are used to treat upper respiratory tract infections, whilst the Echinacea pallida plant's roots are used to treat colds and flu. If they are licensed by the German government, there must be a reason! Studies in the UK have shown that while echinacea may be helpful in the early treatment of upper respiratory tract infections, but there is no indication that it can be beneficial if used for an extended period of time. A syrup made from the plant reduced the number of such infections in children, but it was unable to reduce the severity of their infections. Researchers are also divided about which composition is the best to treat respiratory infections. They concluded that the plant can have a “modest positive effect” but that more research is needed. Echinacea has been documented to both negatively and positively interact with several other medications. People who take immuno-suppressant medications to fight cancer or due to organ transplant should not take echinacea as it can enhance immune function. However, it has been discovered that echinacea can help lessen effects of chemotherapy when taken with specific drugs, and can also help treat athlete's foot and yeast infections when taken with specific antifungal agents. Ask your doctor before taking any supplements, even herbal ones, to see if they are right for you. You are likely to be allergic to echinacea if you have allergies to plants in the daisy family, and people with asthma may experience allergic reactions as well. Mild gastrointestinal discomfort is not uncommon when taking echinacea.